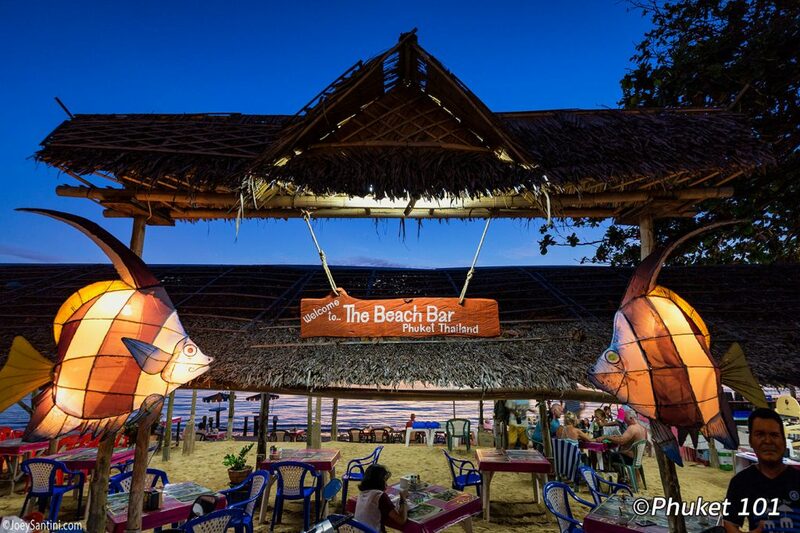 The Beach Bar Phuket is a local restaurant half hidden on Panwa beach, away from most the tourist crowds. 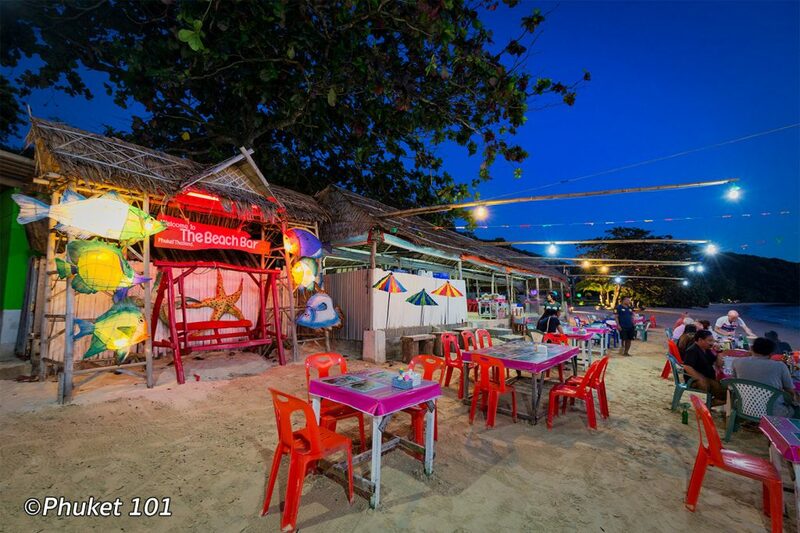 Once a modest wooden shack, the restaurant grew in popularity and now displays a long row of tables and plastic chairs. 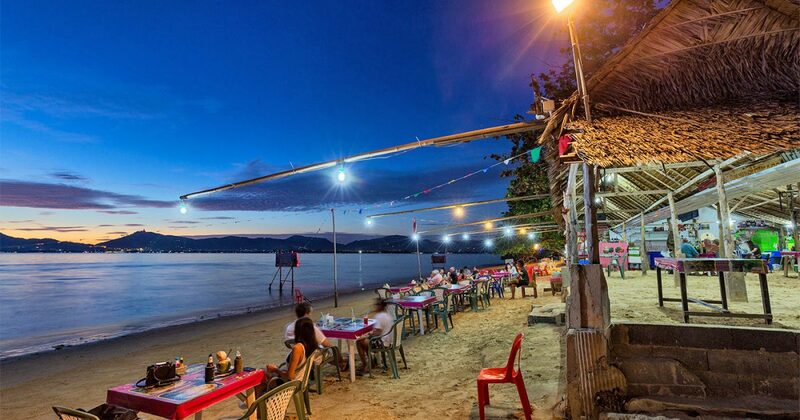 Set on the east coast of Phuket, this fun restaurant is still mostly made of wood pillars with a thatched roof placed on the beach. You will easily spot it between Panwa Boutique Beach Resort and Dream Sea Pool Villa. What makes The Beach Bar unique is its location. 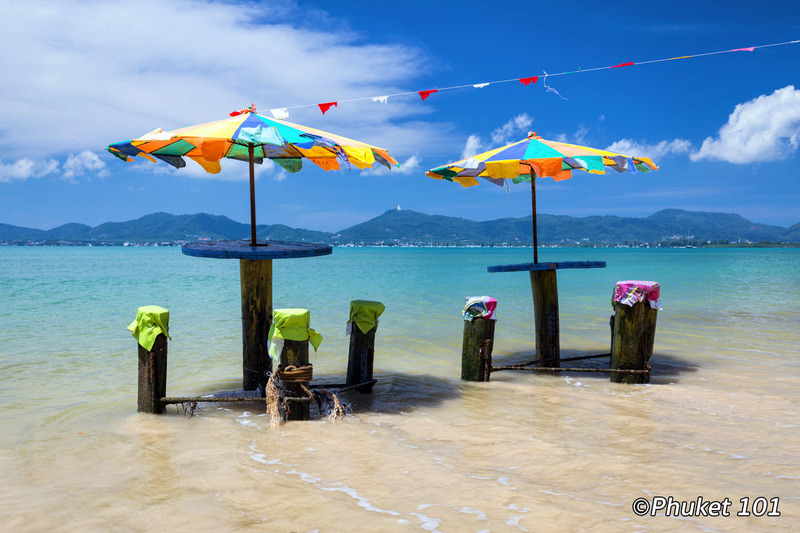 It’s right on the beach with the water so close that some tables and stools are standing in the water at high tide. As the Beach Bar is on the east coast, the sun also sets just opposite of the restaurant, making it the right place for your sunset photos. Once the sun has set, don’t leave yet! Stay a little longer enjoy the blue hour under light bulbs on wooden perches above the tables. To make things even better, drinks are cheap! A Singha beer costs 55 baht, a Heineken 60 baht and a Leo or a Chang Beer is only 50 Baht. Soft drinks are 20 baht and one of those delicious local coconuts 45 baht. 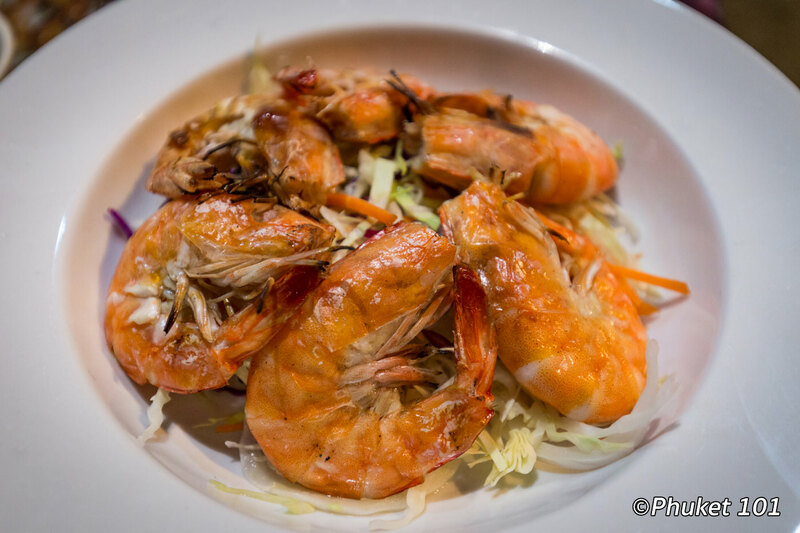 The food is good without being exceptional, but who cares, it’s all about the setting. Nothing beats a drink with your bare feet in the sand and a sun setting in front of you and no office to go to tomorrow. 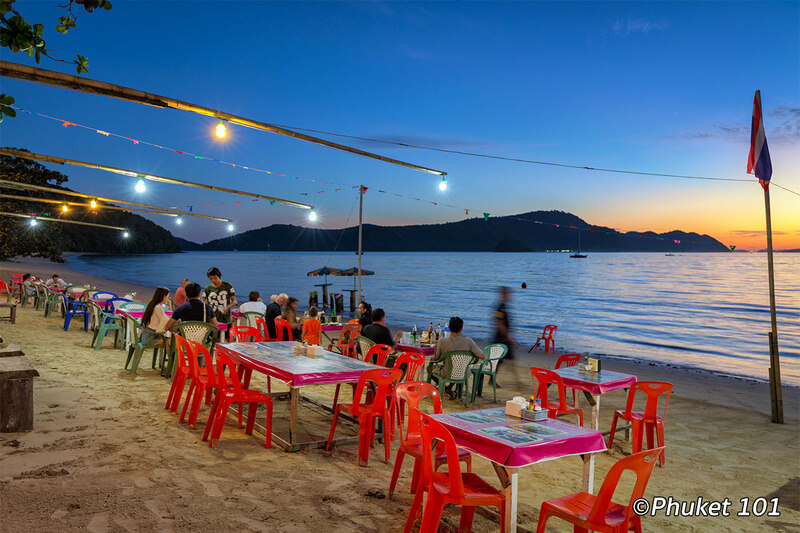 The Beach Bar also serves a good seafood selection: squid, king prawns, Phuket lobster, crab and many ways to prepare local fish the way people love it: barbecued, sweet and sour, deep fried or steamed. The cost is per weight depending on the market price, which makes it quite difficult to estimate the final total price but once again, it remains affordable. 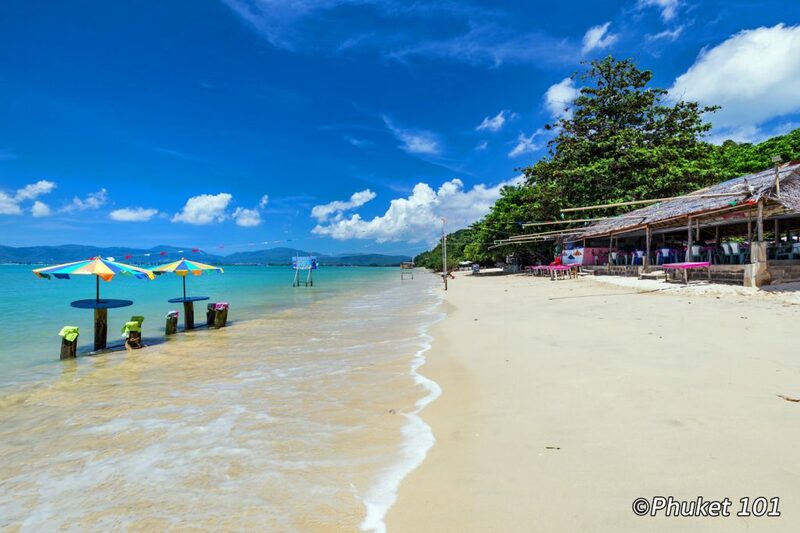 To get there, you will need wheels as it in the Panwa area, about 22 km from Patong Beach, 8 km from Phuket town and 32 km from Bangtao Beach. The Beach Bar has an ample parking space, but the way down and up is a little steep. Most important, remember to be there way before 6 pm as it gets crowded past 5:30 pm!